Comprehensive problem-solving support, engaging visuals, and a focus on the applications of chemistry combine to make this text an ideal match for allied health majors. Throughout the book, the author minimizes complicated mathematics. Early chapters focus on fundamental chemical principles while later chapters build on the foundation of these principles, developing the concepts and applications central to organic and biological chemistry. The Fourth Edition further develops the strengths of the previous editions with a refreshed, contemporary art program, additional challenging problems, and expanded Chemistry-at-a-Glance and Chemical Connections features. A complete technology package accompanies the text and features the new CL Testing program powered by Diploma, the new HM ClassPresent CD with videos and animations, and a new Eduspace online homework course.H. 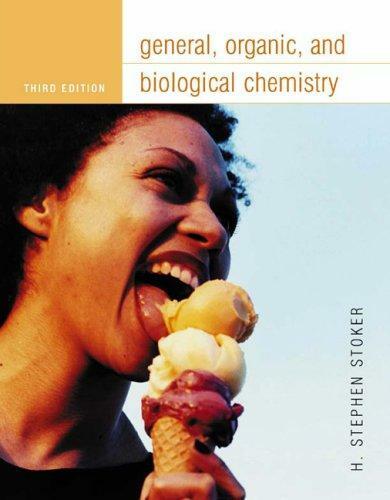 Stephen Stoker is the author of 'General, Organic and Biological Chemistry', published 2003 under ISBN 9780618265978 and ISBN 061826597X.